In an age of reliance on CAD programs, the skill to express your creativity and vision with a hand-rendered drawing gives an interior designer a distinct advantage in communicating with clients and will set you apart from other designers. Develping strong hand visual communication skills without the aid of a computer are especially important to concept development in the interior design profession, and ideation flows rapdily when drawing manually. 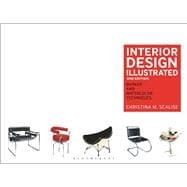 Building on the success of the First Edition, Interior Design Illustrated helps students develop this powerful marketing tool, making them invaluable to their employers. The step-by-step approach, with simple, uncomplicated illustrations and instructions that progress from beginner to intermediate skill levels, teaches students how to visualize interior space, perspective and details (such as pattern and texture) and to render their vision with markers and watercolors. Since the lessons are structured around small tasks, students will become proficient with one rendering skill before moving on to another. The text and numerous illustrations reinforce each other to make the lessons easily accessible to visual learners. The comprehensive coverage includes architectural features, wall and floor finishes, furniture, and design enhancements such as artwork, plants, tabletops, and accessories. Christina M. Scalise , NCIDQ Certificate No. 10331, is a professional interior designer and principal of her own firm. She is also is a part-time interior design educator and has taught interior design studios, professional practice, architectural communications, and rendering courses at Woodbury University, Seton Hill University, and the Art Institutes beginning in 1982. Her writing projects include interior design textbooks for Fairchild Books and Delmar/Cengage, and development of an online interior design program of courses offered internationally through numerous higher education institutions through Cengage. She is certified by the National Council for Interior Design Qualification (NCIDQ) and is affiliated with several professional organizations. Currently, Scalise serves on LaRoche College Interior Design Advisory Board and the NCIDQ 2011 item writing team.